A Study In Silver – Focus… focus… focus… Write. It’s frustrating being an Adonit stylus fangirl, sometimes. Adonit themselves seem content to ignore new iPad releases. 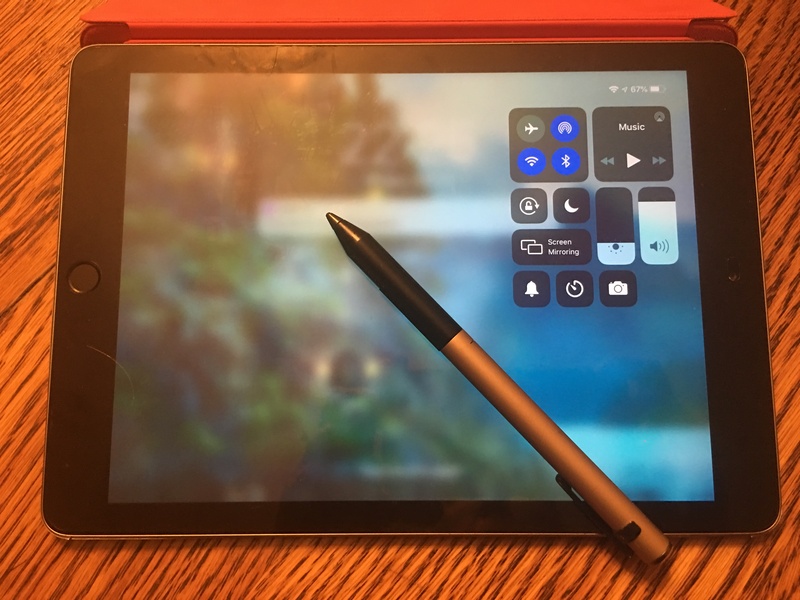 I’ve had an Adonit Pixel stylus since April 2017, and I couldn’t find any information as to whether my stylus would work with an iPad 6th generation, which has been available for more than a year. My new iPad 6th Gen. and my older Adonit Pixel Bluetooth Stylus get along just fine! But my iPad Air 2 (it’s three years old) was rapidly dying, so last week I replaced it with an iPad 6 and took a chance that I wouldn’t need to buy an Apple Pencil. It has 2048 levels of pressure sensitivity. It has programmable function buttons. It’s less expensive than an Apple Pencil. Its battery is durable. Mine is still going strong after 2 years. It doesn’t work with iPad Pro models. It connects with specific apps rather than with the iPad or iPhone as a whole. It requires some setup to get the most from the stylus. In particular, a user needs to set his or her handwriting angle in each app that supports Pixel. The little hand position diagrams can be misleading—best practice is to try each angle setting in each app to see which works best. If Apple says it works with a device, then it does. No experimentation is needed. It’s both pressure and angle sensitive. Setup is like that of any other Bluetooth device. It’s not limited to use only in apps that support it. The Pencil doesn’t work with any iPhone, and is limited to iPad Pro models, and very recent less-expensive iPad models. It’s more expensive than the Adonit Pixel. It has no function buttons. There are problems with the Pencil battery if you don’t use the Pencil often. Honestly, if I were buying now, it would be a hard decision. I’m accustomed to my apps that support the Pixel, so the Pencil’s usability in more apps isn’t persuasive. On the other hand, Apple will make sure that the Pencil will work with my iPad 6 through iOS upgrades regardless. There’s no such assurance for the Pixel. If my Pixel should bite the dust, I’ll probably get an Apple Pencil. But as long as my Pixel holds out, I’ll enjoy pressure-sensitive drawing on my iPhone as well as on my iPad. Scrivener syncing among various iOS devices and computers is a popular subject. The iOS Scrivener tutorial is a useful introduction which covers the basics. There are also several excellent Literature and Latte videos on this subject, as well as in-depth Knowledge Base articles. What’s not covered is how to protect your data if all you have is iOS Scrivener. Maybe you just don’t have a Mac or a PC. Maybe you’re on vacation, or on a business trip, and only brought your iPad or iPhone. In these situations, how do you make a backup? 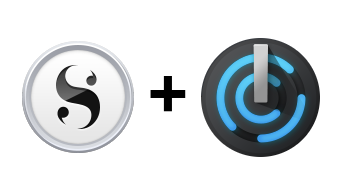 If need be, how do you restore a backup to iOS Scrivener? Fear not, there is a way. I’ll show you how with screenshots from iPhone Scrivener. You can also use the Restore process to restore a zipped backup from Mac or Windows Scrivener to iOS Scrivener. Backup from iOS Scrivener is not hard, but the way to do it isn’t obvious—there’s no big button that says “backup.” You don’t need Dropbox for this; any cloud service that you can access through the Apple Files app will work. In fact, if you ordinarily use Dropbox for syncing among devices, I recommend you use a different service for backup. In iOS Scrivener, tap the Edit button at the top of the projects list. Tap to select the project you want to back up. Tap the Share button at the bottom of the screen. You’ll see a brief message that says “Creating Archive.” This is when Scrivener zips the project into a backup file. Scrivener will display the standard iOS Share panel. Select the “Save to Files” option. Go ahead and save it anywhere you like, except “On my iPhone/iPad” (or Dropbox if you use Scrivener Dropbox syncing.) Yes, iCloud is fine, Google Drive works… any service you can access here will work. For this demo, I’ll save my backup to the Scrivener folder on iCloud Drive, but again, any cloud service connected to Files will do. That’s it for backup! You’ve created a .zip archive from your project, and saved it to a cloud service. When you have an internet connection, that cloud service will save your backup on its servers. The problem here is that iOS Scrivener can’t open a zipped project directly. You’ll need a utility that can open a zipped project, and send the result to iOS Scrivener. I’ll show you that utility, FileApp File Manager, and demonstrate how to use it to restore a zipped backup to iOS Scrivener. If you haven’t already, download and install FileApp File Manager by DigiDNA SARL onto your iOS device. Now open the Apple Files app, and select the backup you saved in step 4, above. Then tap the Folder (Move) icon. In Apple Files, tap On My iPhone > FileApp > Downloads. Then tap the Copy button. Open the FileApp app and tap on the Downloads folder. FileApp asks if you want to decompress the file; tap UnZIP. iOS Scrivener will open. Select a location for the project. Scrivener will create the project and open it for you. You’ve now created a backup in iOS Scrivener, saved it to a cloud service, and restored the project from that backup to iOS Scrivener. You can use the Restore process to both restore iOS-created backups and import Mac- and PC-created zipped backups to iOS Scrivener. Syncing between Scrivener projects and AT2 timelines only happens between desktop versions. iOS Scrivener and iOS AT2 don’t interact. If you are an iOS-only user, you’ll need to build your AT2 timelines manually. If you have both desktop versions, your changes in iOS AT2 and in iOS Scrivener will coordinate when you run a sync in desktop AT2. The rest of these tips presume that you have desktop versions of both apps. If I can’t see it in Scrivener, I don’t bother. I use AT2 when I need a time-based view, and to do massive “time when things occur” changes. Things that I can add to AT2 but which I can’t sync to Scrivener [Examples: Character entities (neither names nor notes), Place notes, Arc notes] I don’t bother with. Instead, I create “events” from my Scrivener notes on these things, and place them on the timeline at the point they first appear. I use Scrivener keywords (AT2 tags) for character names. If I don’t have a use for an AT2 field, I don’t bother. This may seem obvious, but if I see a field in a template, I assume I must fill it in—that it serves some purpose I don’t know about. I spent hours, for example, wondering what to do with the Tension field, coded as a percentage. But it made no sense to me, so finally I deleted it. It was the same with Participants/Observers; first they force me to use Character entities in AT2, which don’t sync except as names of Participants or Observers. Second, I get almost all of that info by simply tagging/keywording events with my character tags. So I don’t bother with those, either. Structure your Scrivener project to help AT2. AT2 gives warnings when a Scrivener item isn’t connected to an AT2 event during sync. These can run into hundreds for a large project! AT2 can also be set to ignore both folders and non-text documents during sync. To use this to your advantage, set up your Scrivener project to use a document and not a folder as container for anything you’ll want on the timeline. (For example, you can change a chapter folder to a text. It will still contain its scenes, but it will be easier to put the chapter itself on an AT2 timeline and track it there. For clarity, I’ll refer to such a changed folder as a “document group.”) You can adjust your global Scrivener preferences to treat all document groups as folders (see section B.4.5 in the Scrivener manual). You can also adjust your project settings to treat document groups the same as folders during compile (see section C.2.3 in the Scrivener manual.) Conversely, use a folder for any container you’re sure you don’t want on the timeline. In this way, you can make AT2’s sync warnings when a Scrivener item is not connected to an event fewer and more useful. For Scrivener 3 (Mac, and Windows beta), set up your date fields in Scrivener before your first AT2 sync. Use the Custom Metadata feature to add both a Start Date and an End Date field to your Scrivener project. Make these fields plain non-wrapping text fields. My experience suggests that using the Scrivener date field type option (which will be used if you let AT2 automatically create these) is fraught. Any change—to Scrivener, to AT2, even an OS update—may result in dates being misinterpreted. Text fields are safe. Make use of Scrivener’s Title, Status, Synopsis, Keywords, and Labels metadata. These can all be synced with AT2. In general when syncing, a Scrivener thing (text, folder, document group) will connect to at most one AT2 event; you can set various Scrivener built-in metadata to sync with that event’s properties. Scrivener Labels sync to Colors in AT2, Status to Complete, Keywords to Tags. Scrivener’s Title will be AT2’s event name. Scrivener’s synopsis syncs as the AT2 event’s Summary.1 This gives you a pretty darn complete outline in AT2. 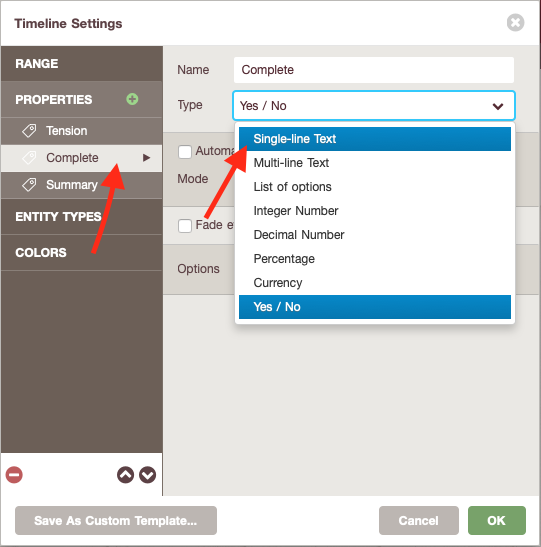 When you create your timeline file, correct the Complete property format. AT2 creates this as a simple checkbox in the Fiction template. Before your first sync with your Scrivener project, change this to a single-line text field. 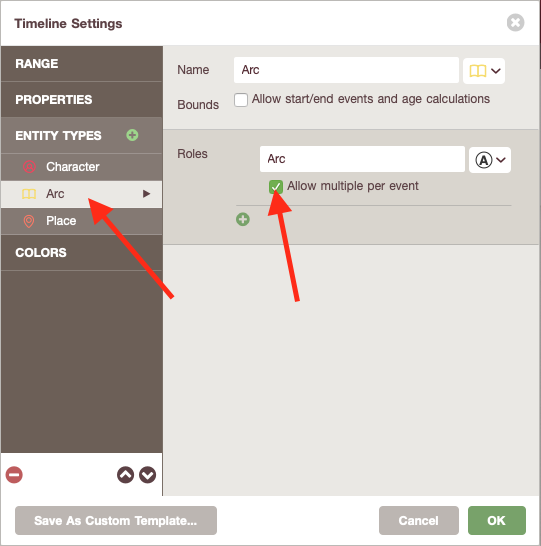 (In AT2: Timeline > Timeline Settings > Properties) Then AT2 will automatically offer you the opportunity to sync AT2 Complete with Scrivener Status. I hope these tips help you use Aeon Timeline with Scrivener effectively! As of this post (Mar 30, 2019), there is a bug in AT2 that prevents it from creating more than one metadata field in Scrivener at a time. To work around this, you can either create the fields in advance in Scrivener, or create them in several passes in AT2 by repeatedly tapping the gear icon in the sync panel. The headline says it all! I finished my entry, polished it, had it beta-read, and sent it two weeks before the deadline. Last year, I barely finished a draft under the word limit by the deadline, let alone performed quality assurance. Further, I managed to do all this while only cutting two scenes—maybe 500 words. Last year, I cut 4,000 words—the length of my entire entry. I may, at last, be getting the hang of this fiction-writing thing. How good is it? I’m typing this review with it. Let’s talk about portable bluetooth keyboards in general, for a moment. 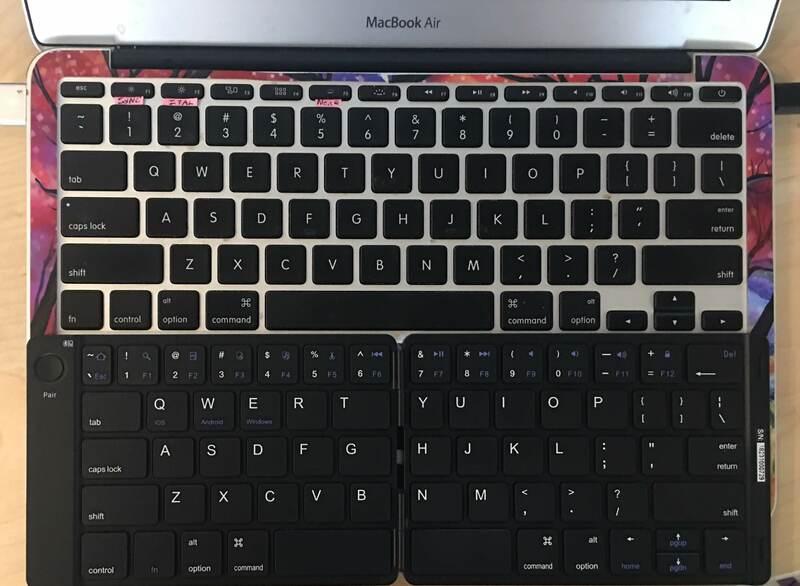 The MacAlly’s key row height is the same as that of the Macbook Air 11. 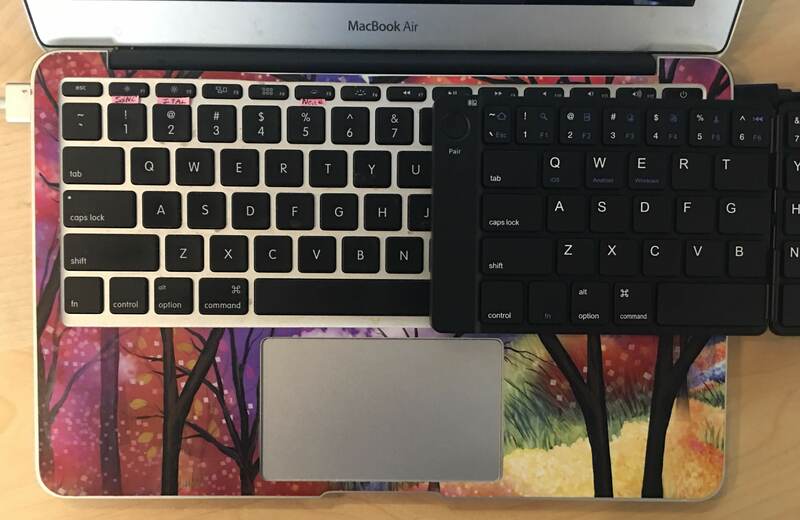 The MacAlly keyboard is only slightly narrower in width than the MacBook 11’s keyboard. The keyboard’s drawbacks are those of any foldable keyboard I’ve ever tried: the vulnerable point is always the hinge, and the flexible cables used to bridge it. It’s all-plastic construction as well—not as sturdy as the same thing done in aluminum. There have been a few reports of keys sticking in the Amazon reviews as well. Overall, though, I can recommend the PMOBILEKEY for travel or any other application where light weight and small footprint are key, if treated gently. Just don’t stick it in your jeans pocket, sit on it, and expect it to survive. DST may be bad, but more daylight in general is good. I’m getting out in it, too. I’m solidly on my keto diet, more solidly than I’ve been for three months. I’m really focusing on using the tools I’ve found helpful and ditching those that aren’t. I’ve found that revising a novel outline (or even creating one! but that’s another post…) is difficult, so I spent some time setting up a system to be sure that I can use my best tools. Limiting how far I can wander when distracted. It’s way too easy for me to go crazy writing in the index card/synopsis area of Scrivener. I’ve abandoned projects before because I’d put Too. Much. Information. into the outline. Now that I’m using a variant of Save the Cat! Writes a Novel (Jessica Brody) outlining, physical index cards for outlining are a suggestion. The nice thing about physical index cards is that there’s a limit to how much I can put on one; the crummy thing is that getting them back into Scrivener is a pain. So I artificially limit the size of my Scrivener synopses. I feel better if each synopsis (beat) only contains the amount of info I can jam onto a 5″×3″ index card (11 lines of 43 old-fashioned typewritten characters each.) Yes, I counted. Yes, I’m obsessive. Sue me. Handwriting. Misery, thy name is “dictation,” but I find that typing is not ideal for my fiction, either. It works for my nonfiction, but my fiction works better if I handwrite. Everything. (Not on paper! I use a handwriting keyboard.) When I’m stuck, I get antsy and want to have a pencil in my hand. Today I spent some time setting up both my iPad and my iPhone to be effective handwriting editors for those 437 characters. I now have a smooth outlining workflow from Scrivener Mac to the iThings and back. The result? I managed to get seven Save the Cat!-style beats revised today. The appropriate sections affected by changed beats are marked for intensive revision. I feel like I can rip right along now and get all the stuff I dictated in November docketed and slated for revision in a week. Damn! That is amazing! Here’s hoping it’s not a flash in the pan. While waiting on my beta readers for my NaNo Los Angeles submission to get back to me, I picked up the novel that I’ve been working on two. Freaking. Years. Now. But I’m not frustrated… much. The problem is that I started the novel about three outlining methods ago. My most recent notes are Story Genius (Lisa Cron) character background scenes. (I’m still using them—very useful and I’ll never start a novel again without them. Don’t need them for short stories, though.) Less recent notes are Save the Cat (Blake Snyder) (40 chapter “scene” cards), all of which need updating at the least. I even have some very old notes that date back to Rock Your Plot (Cathy Yardley). What I’m finding, to my sorrow, is that I never used the logline template from Save the Cat! Strikes Back (Blake Snyder. )1 Since I started the work, I’ve learned that if I can’t fill out the logline template, I don’t have a story—yet. When I filled it out Wednesday, I realised that one of my favourite characters has to die. In fact, she needs to die about 20% of the way through the book. Dammit. But keeping the poor woman alive was twisting my story. I’d begun to dread writing her scenes. I couldn’t figure out how for her to interact with anyone else. That’s because she was supposed to be dead already. The good news is that I doubt I’ll need to throw out more than about 3K words out of my 90K target. She has that little impact on the story. That’s how much she needs to die. Excuse me while I go make my murder mystery more murderous. Yes, the story’s out for beta—four weeks ahead of deadline! Assuming my beta readers get back to me quickly, I’ll be able to submit my entry two weeks early! Wow! This is amazing. There’s no comparison to writing my entry for last year’s NaNo Los Angeles anthology. Last year I scrapped a 4,000 word draft at about this point, and was scrambling to make the March 21 deadline from scratch. This year, I’ve only scrapped about 900 words. I will have time to adjust and polish before the March 31 deadline. I know that Mr. Snyder insists that all 15 of his beats be nailed down before starting to write, but I… well, I just couldn’t. Not the way he does it. What I did was write a logline using the “enhanced logline template” from Save the Cat! Strikes Back (also Blake Snyder), Chapter 1. This rocks for me. The other difference is that last year, I hadn’t had the experience of working with professional editors on fiction. I hadn’t had five subplots ruthlessly cut because—Dun! Dun! Dun!—they had nothing to do with the main story. In a 4000 word (max) science fiction or fantasy story, I can’t mess around. I need to get my universe established without wasting words, and get the story moving—fast. Maybe I can wander a bit in a novel—but if a subplot has no effect on the finale, I can and should chop it no matter how personally interesting I find it. Not helping me get to an island (beat)? It’s got to go. In case you think that this eliminates all the art in a story—it doesn’t. I composed my best sentences in last year’s story because I absolutely had to cut something and yet convey its concept better. My story was more compelling for cutting extraneous events to the bone. So onward! This year’s NaNo Los Angeles deadline is coming!